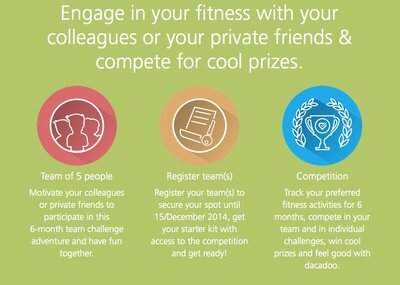 dacadoo launches its new product “The Team Challenge World Cup"
A 6-month fitness activity tracking competition that will start January 1st, 2015 and where company teams of 5 employees each will compete against other teams around the world. 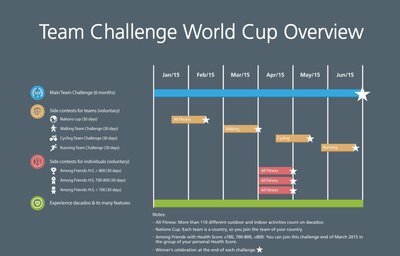 Zurich, Switzerland – dacadoo, the Swiss mobile health company, launches its new product “The Team Challenge World Cup”, a 6-month fitness activity tracking competition that will start January 1st, 2015 and where company teams of 5 employees each will compete against other teams around the world. The winning team will get a check of USD 5,000 which will be donated to a charitable institution in the name of the winning team. dacadoo launches its new product “The Team Challenge World Cup”. dacadoo offers a comprehensive mobile health promotion and lifestyle navigation solution that enables people to track, manage and benchmark their health & well-being in an easy and fun way. Corporate wellness solutions such as the one from dacadoo are gaining traction among companies in the USA and in Europe who offer wellness solutions to their employees as part of their corporate health management initiatives. 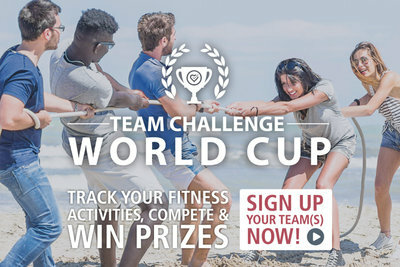 In addition to its full-featured mobile health engagement solution, dacadoo now launches a new product to target the competition-affine within the corporate wellness segment with dacadoo’s “The Team Challenge World Cup”. In this 6 months fitness activity tracking competition, 5 colleagues from work will compete in a team against other company teams from around the world for fun, honor and recognition, while engage in their own fitness and wellness at the same time. The winning team of the Team Challenge World Cup will receive a check of USD 5,000 which will be donated to a charitable institution in the name of the winning team. There will be various other prizes for the winners in the different side contests of this fun team challenge.